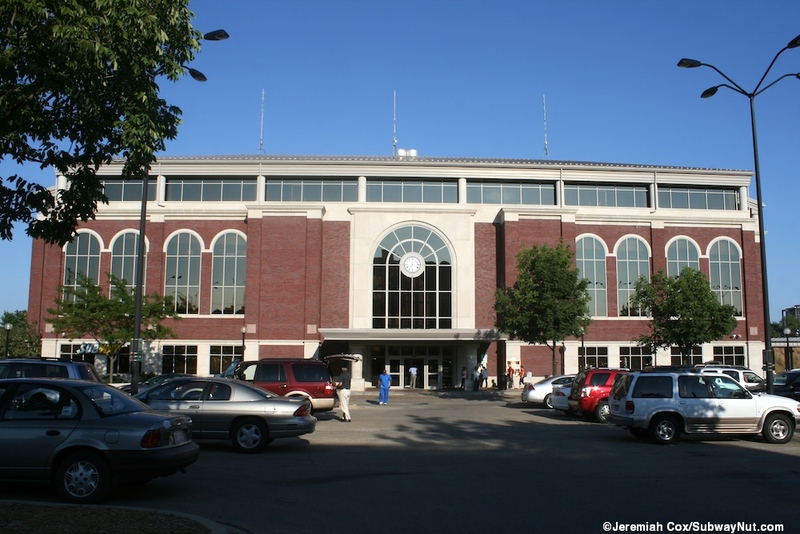 Champaign-Urbana has received continuous service from the formation of Amtrak, generally from two or three trains per day. 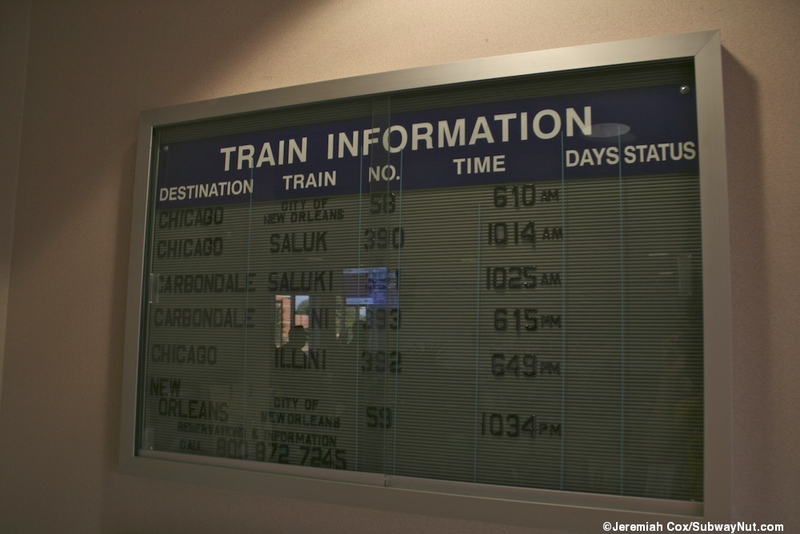 The City of New Orleans (called the Panama Limited until 1981) has always stopped and it has been supplemented except between March 5, 1972 and December 19, 1973 by local trains to Chicago. 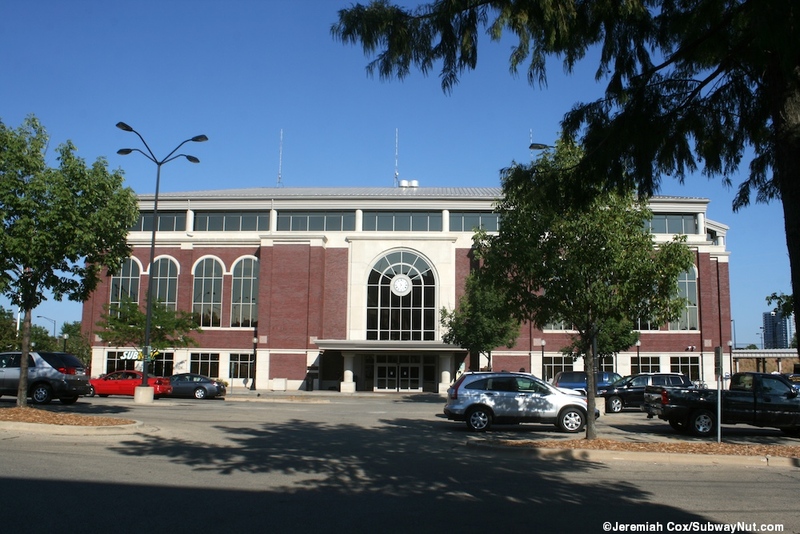 The main one that has run continuously except for that year and a half is the Illini. 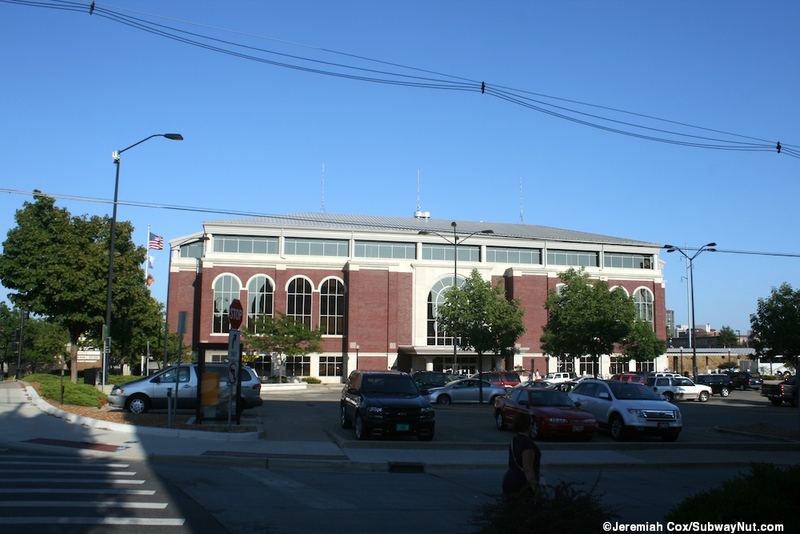 It is named for the Fighting Illini of the local University of Illinois in Urbana-Champaign. 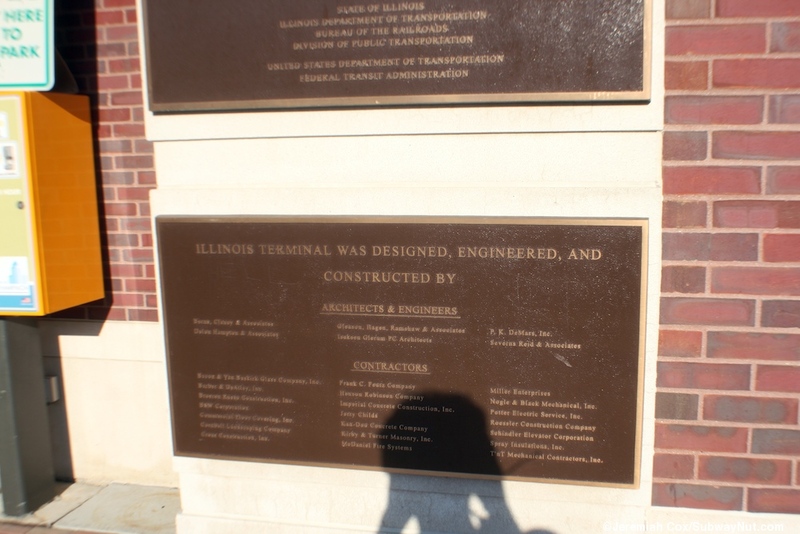 It runs southbound from Chicago generally to Carbondale but terminated at this station in some years and ran to Decatur from 1981 to 1983. 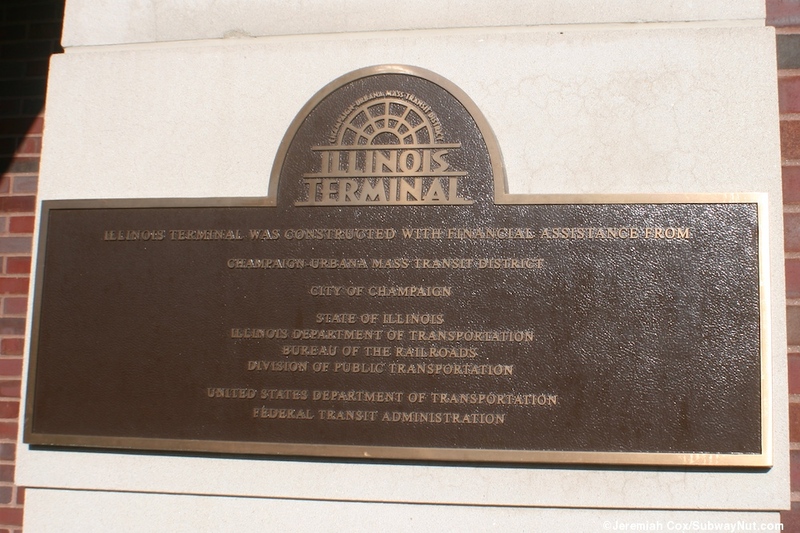 Twice a third daily train has served the station running from Carbondale to Chicago: the Shawnee ran (except for that one gap in service) until January 12, 1986. 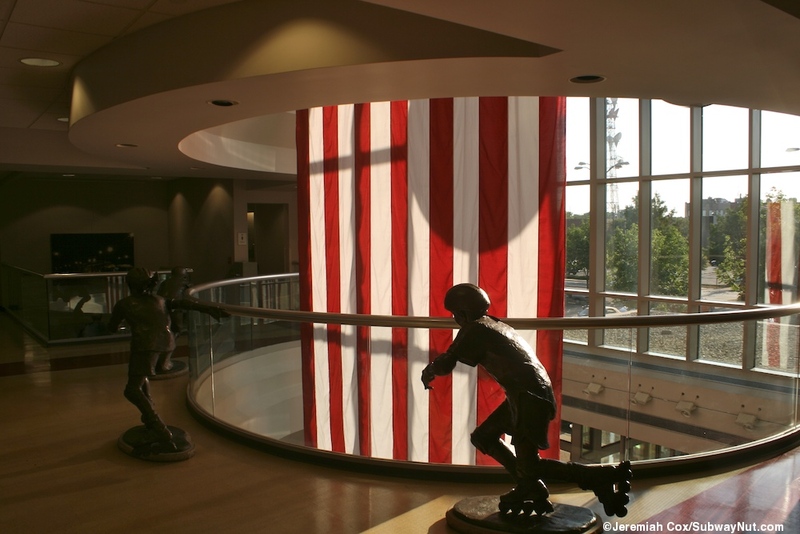 Most recently, starting on October 30, 2006 is a train called the Saluki (after the dog breed and mascot of Southern Illinois University in Carbondale) that provides the morning round-trip while the Illini provides the evening one. 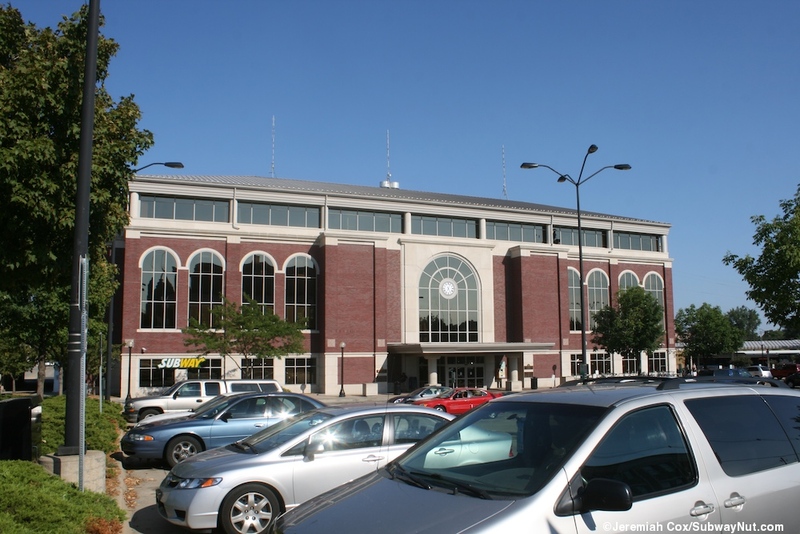 The station is the most significant intermediate stop in terms of ridership on the Illini/Saluki and only intermediate staffed station except for Homewood in the Chicago suburbs. Checked baggage service is also provided for the City of New Orleans. 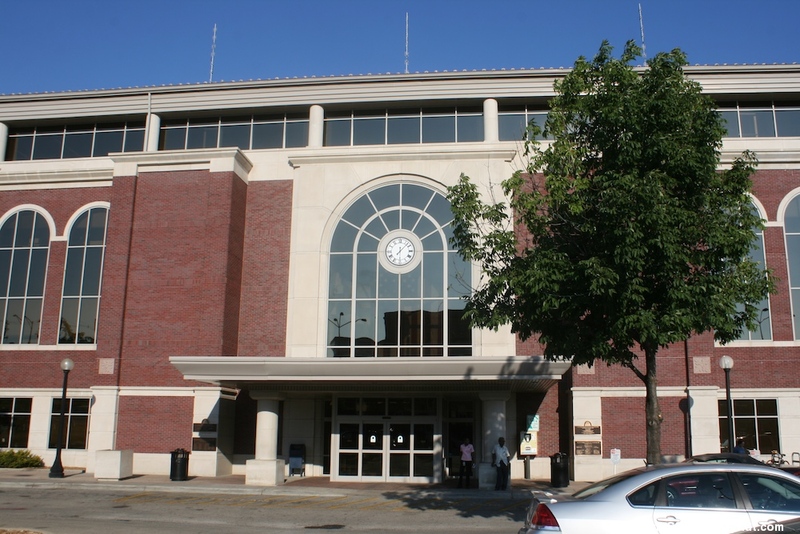 The present station is inside the Illinois Terminal, a large and modern four story intermodal station building shared with the main hub of MTD, the Champaign-Urbana Mass Transit District (including its customer service office), a Greyhound/Trailways ticket office, the offices a state senator, meeting space, and other community organizations plus office space. There is an impressive three story sign outside the building listing 15 different tenants or transportation services. 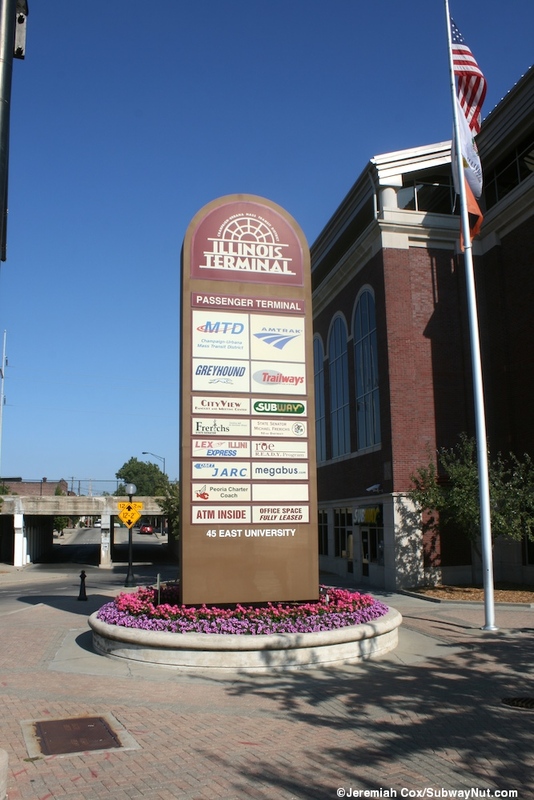 Amtrak is right on top with an equally large logo for MTD with Greyhound and Trailways logos beneath. 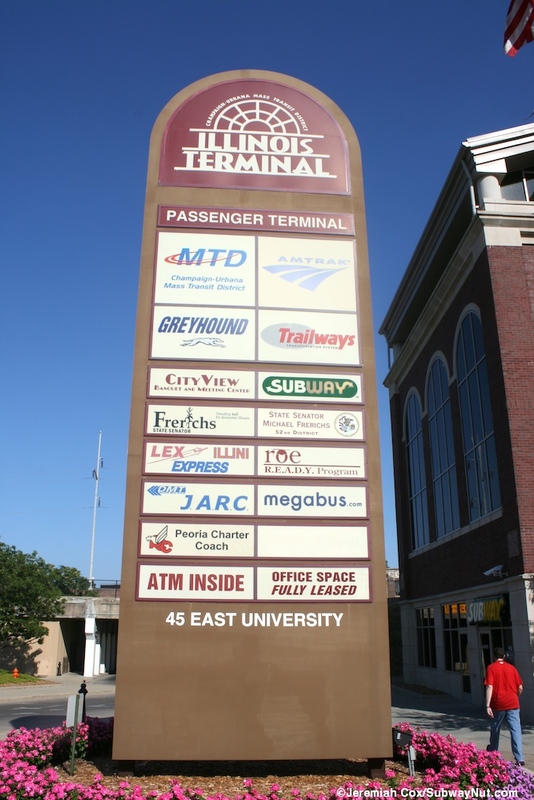 Other bus lines serving the station include the DMC JARC to Danville, Megabus, Lex Lincolnland Express (a reservations based bus service aimed for students from downstate Illinois to Chicago) and the Peoria Charter Coach Company providing airport service. The one food concession is Subway. 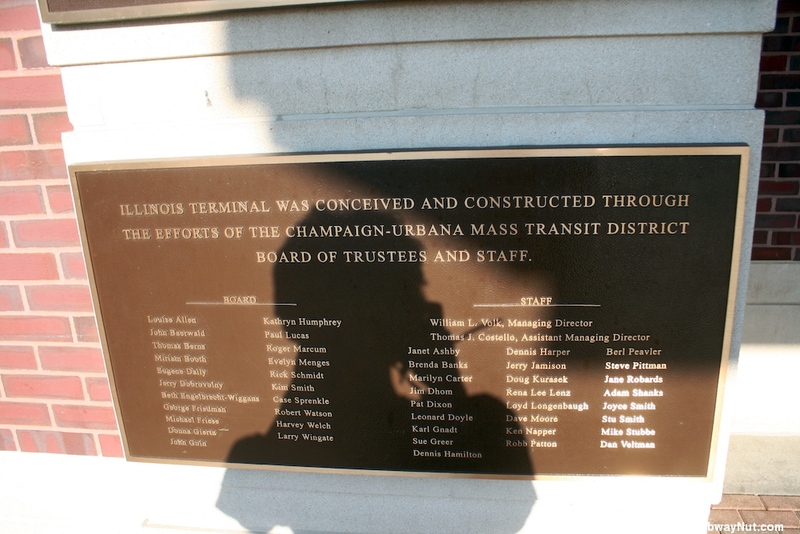 The transit center opened in January 1999. Trains previously stopped just across the street at the historic Illinois Central Railroad Depot built in 1898 north and right across University Avenue from the present modern depot.This building still stands but has been turned into private businesses and I neglected to really photograph thing the original building was a different one two blocks north. The station and city is not a place for photographing trains as trains cross through downtown Champaign (trains don't actually cross through Urbana a city just east and adjacent to Champaign but the university is called by both names, being located in both cities so the station uses both) on a single track grade separated embankment with each street crossing beneath the tracks in an underpass. 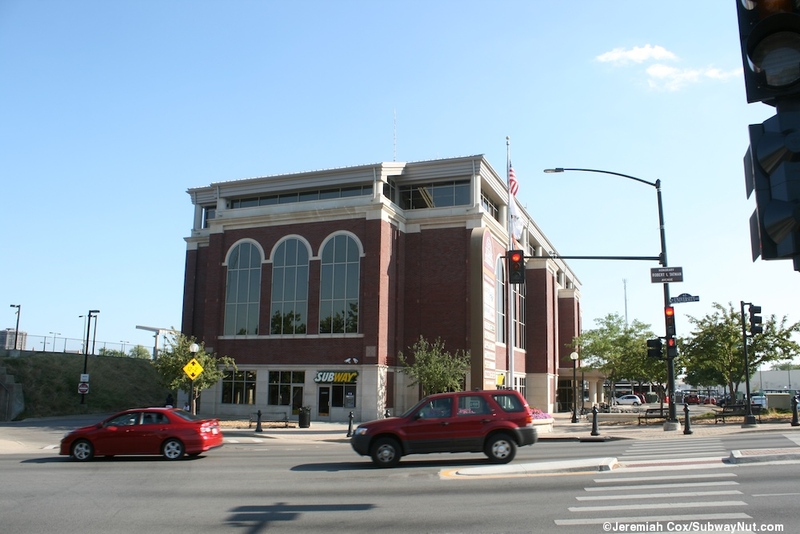 The nearest grade crossing is Bradley Avenue one north of the station. I was hopping to photograph the southbound Saluki and then the northbound I was taking but trains stop at a platform with restricted access to ticket passengers only and the doors to the platform only open after the trains have arrived in the station. The platform is on the west side of a track that is located beneath the grade of the track right along the ballast with a tactile warning strip requiring yellow stools to board trains. The platform is quite long stretching from Logan Street's underpass across University Avenue's underpass and ending north of here with a ramp down to in front of the old depot with a sign (but no fence) saying 'No access to trains.' 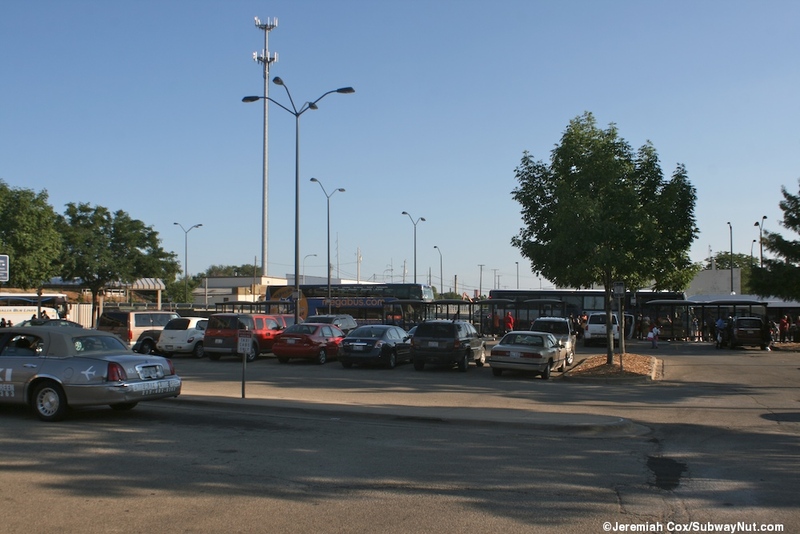 The portion of the middle of platform across the bus loop from the terminal building is canopied. There are a few non standard signs here of black text on white reading Welcome to Champaign — Urbana and two more stacked on top of each other showing the direction of travel with arrows: Chicago (north) and Champaign (south). To reach the station building there is an overpass over the station's long bus loop. It is covered with a roof of opaque tiles letting some light it. 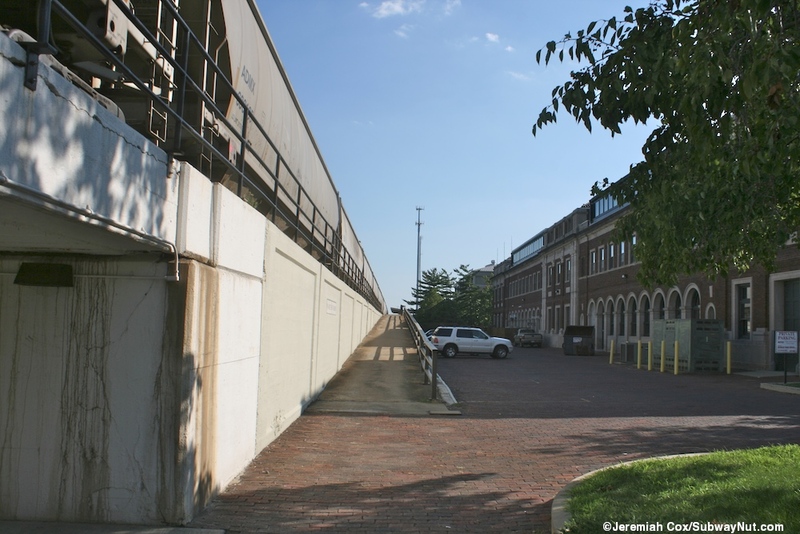 This overpass has a wooden fence running down the middle of it with the northside for passengers leading two sets of automatic doors controlled by the ticket office (opened when I was there after the train had arrived), reaching the Amtrak waiting room just beyond the ticket office. 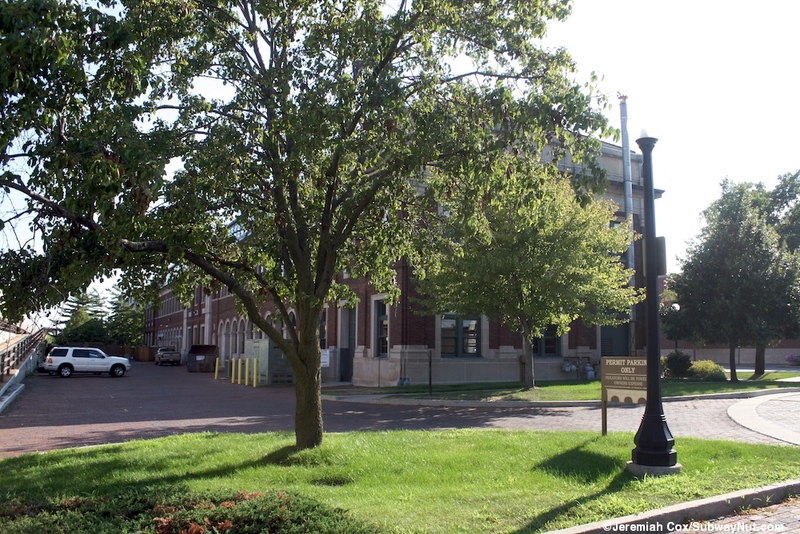 The south side is non-public and leads into the Amtrak ticket office and baggage room. On this side of the overpass (each side can be gated off from the platform along it separately) a mobile wheelchair lift and other baggage equipment was being stored. The waiting room is large and modern with black individual chair (non-padded) benches. There is a Quik-Trak machine is a corner opposite from the ticket office. 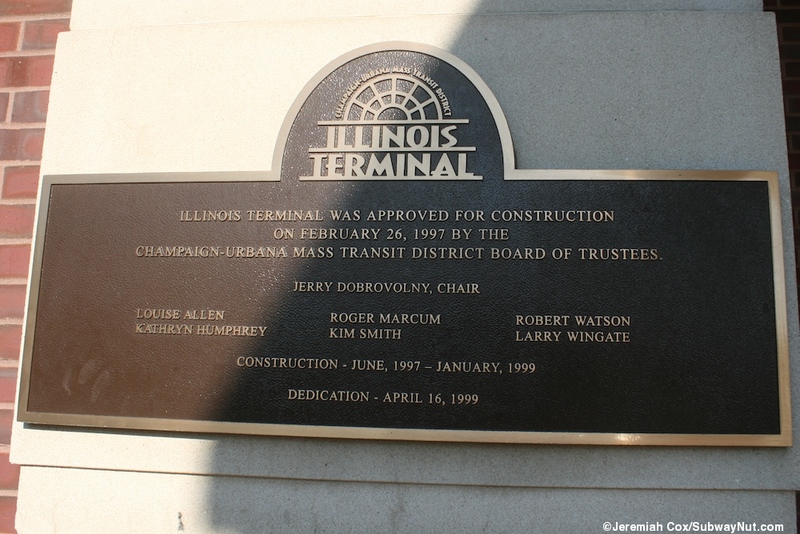 Monitors are branded as Welcome to Illinois Terminal and list the regularly scheduled times of the three daily train departures but can't be updated with lateness information requiring announcements for this. To get downstairs and to street level are stairs down an airy atrium as well as an elevator. There are large restrooms on each floor. 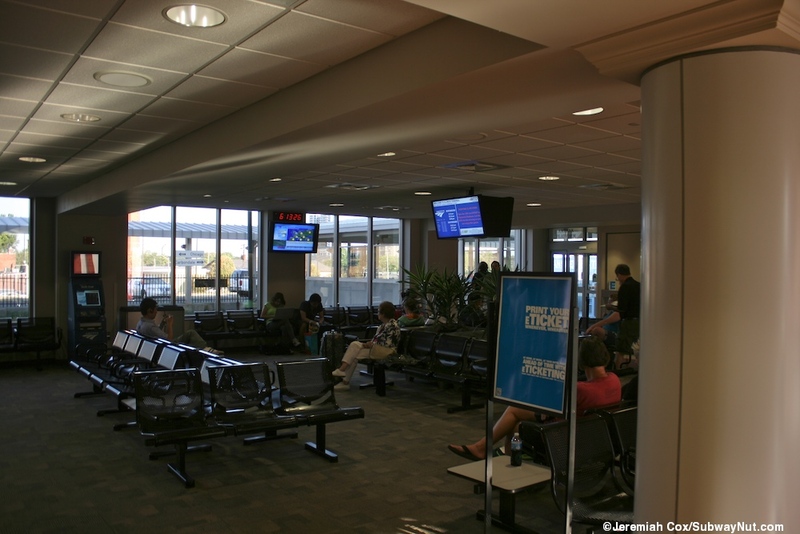 The second floor not occupied by Amtrak is the non-public offices housed in the terminal. 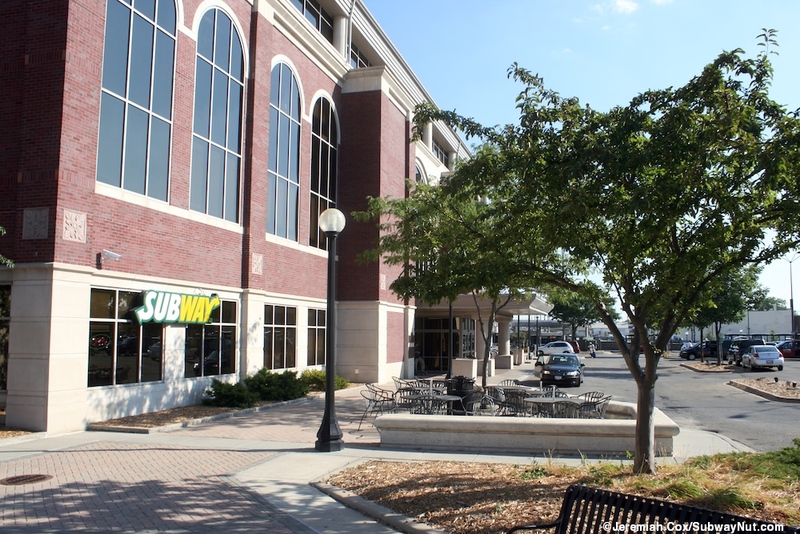 Downstairs is the main public area with separate offices for Greyhound/Burlington Trailways tickets and MTD customer service as well as the Subway Sandwich Shop. 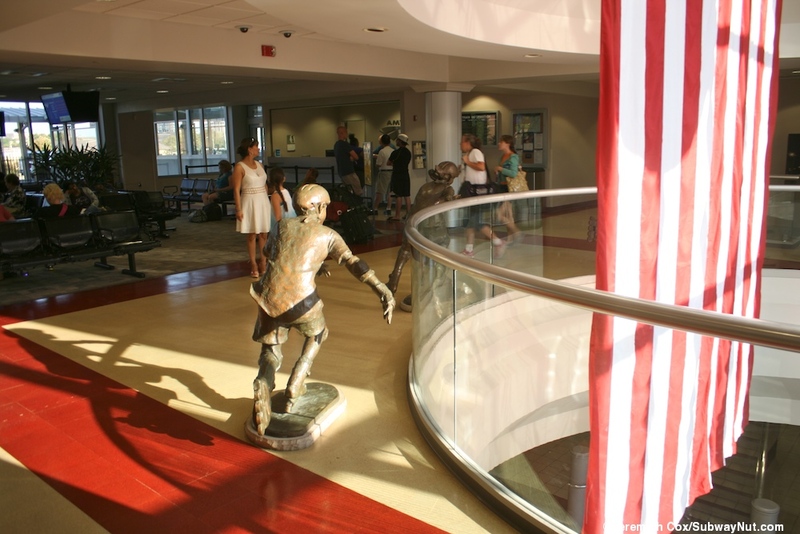 There is neat public artwork in the terminal on the upper level it is bronze statues of roller skaters. The bus loop begins on University Avenue and begins with the line of stops for MTD these are complete with LED signs listing departures. At its southern end it curves to reach the exit to Market Street and this is where there are a few shelters and the stops for intercity buses. Surrounding the terminal at street level is a large paid parking lot but Amtrak has a free long-term up to 14 day lot on the other side of the tracks.